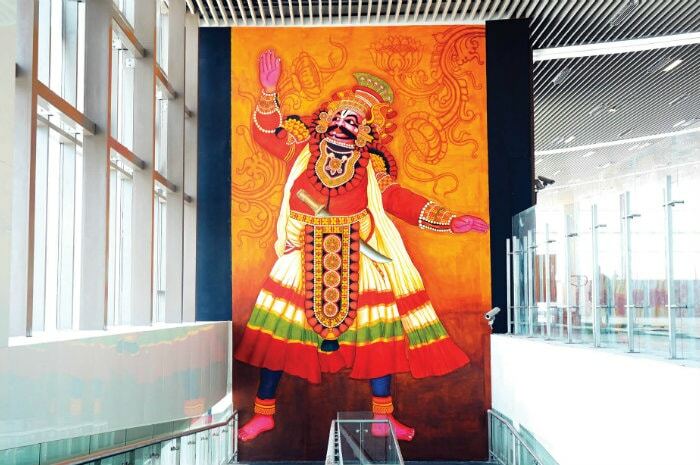 Kannur: Artistic creations at Kannur International Airport are depicting cultural traditions of Malabar and Kannur. 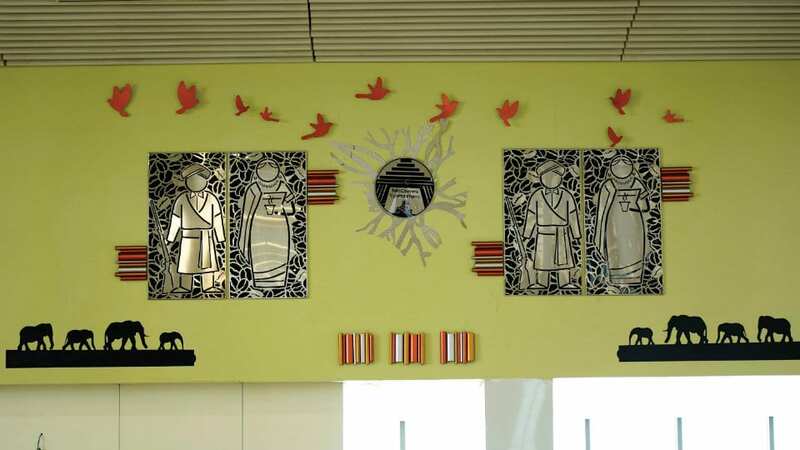 The airport authorities have now added two more pieces of art representing the cultural heritage of Karnataka. While one metal art picture represents Kodava culture, the other depicts Yakshagana, the traditional art form of Dakshina Kannada. These pictures have adorned the walls of the Airport along with those depicting the cultural heritage of Kerala, especially the North Malabar region. The Kannur International Airport Limited (KIAL) is scheduled to be inaugurated on Dec. 9. Kerala Chief Minister Pinarayi Vijayan and Union Minister for Civil Aviation Suresh Prabhu would jointly light the lamp inside the terminal building, marking the inauguration. According to Airport authorities, it was decided to give Karnataka due consideration, especially Kodagu because of its proximity to the airport, though it is geographically part of another State. Virajpet in South Kodagu is just 58 kms away from the Airport while Madikeri, the headquarters of Kodagu district, is around 90 kms away. The metal art work on Kodagu culture was prepared by the artists of Charu Art Gallery, a Mysuru-based art consultancy. In the picture, a woman clad in traditional Kodava attire holds a cup of coffee while a man (also clad in Kodava attire) holds a gun and wears a dagger. The background of the picture features coffee beans and the frame also includes birds and elephants. ”The coffee mug in the hands of the woman, dagger and gun in the hands of the man, and coffee beans in the background symbolise Kodava culture. The birds and elephants represent the wildlife of the region. The picture is finished in mild steel, stainless steel copper. This picture has been approved for display by the Department of Kannada and Culture, Government of Karnataka,” said A.N. Bheemesh, Managing Partner, Charu Art Gallery. Speaking to Star of Mysore this morning, Bheemesh said that ‘Mix Media’ concept has been implemented while depicting Kodava culture. “Traditional art is normally depicted at all airports and even the Kannur Airport has them. But this is for the first time Mix Media concept has been used. Other symbols used in the art include Talacauvery Ugamasthana (birth place) of River Cauvery and a representation of flora and fauna. In all, the art work depicts the entire mood of Kodagu,” he added. Bheemesh revealed that a team of nine artists worked for over two to three months to come up with the design and implement the same. “The art work, 38-feet wide and 10-feet high, was specially commissioned by the Kannur Airport authorities and they were interested in Kodagu art due to the district’s proximity to Kannur,” he added. The second art work is a giant picture of Yakshagana, the traditional theatre art form of Karnataka. The picture in a 9-metre high and 6-metre wide frame is a creation by a team of mural artists led by well-known mural painter K.R. Babu. ”The picture is drawn in mural style using traditional colours such as Indian red, yellow ochre and sap green. Black and blue are also used in this picture. Perhaps, it is the first time that a picture of Yakshagana, that too in huge size, is drawn in the traditional mural style of Kerala,” said Babu, the former Head of the Department of Mural Painting, Malayala Kala Gramam, Mahe. Murals by Babu also adorn the walls of Kozhikode International Airport and Pazhassi Smrithi Mandapam.